The golden yellow fringed Parade flag 4'4" by 5'6" for the U.S. NAVAL SEA SYSTEMS COMMAND. The flag is nylon base with embroidered central device. 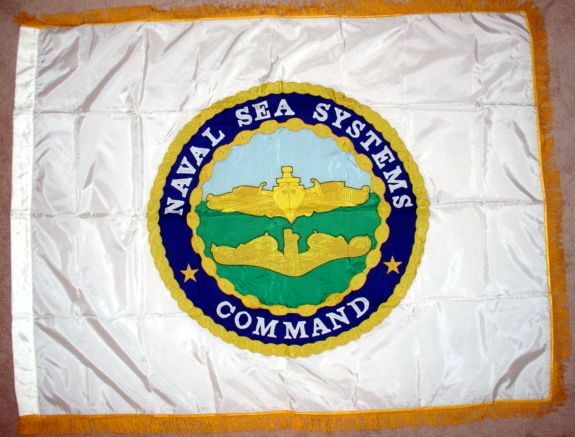 The Naval Sea Systems Command is the largest of the U.S. Navy five systems commands. It is a materiel organization. It consists of four shipyards, eight warfare centers of which are two undersea and six surface, and four major shipbuilding locations along with the NAVSEA headquarters at the Washington Navy Yard in Washington, D.C.